The World Class roadshow rolled into Bristol last week, taking up residence in the city’s newest bar, Red Light. 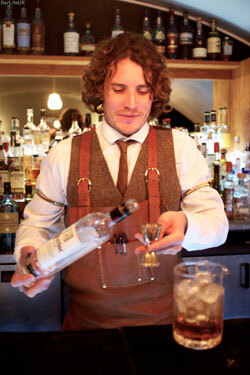 Heat winner, James Fowler, making his drink ‘Copper Colours’. The final heat in burst one of the competition, Bristol followed rounds in Edinburgh, Manchester and London, and like these heats, would award a place in the UK final to the winner. BarLifeUK have been pretty vocal in appreciation of Bristol’s cocktail credentials, and so we were looking forward to the judging session. Happily, the standard was superb, with some out-of-towners from Bath and Bournemouth completing the World Class South West Ranks. As with the other heats, competitors were tasked with navigating three rounds – presenting their bespoke World Class Cocktail, a mystery box challenge, and finally a speed round. The bespoke drinks were all very good, and at the end of this round, the scores were pretty close. However, the mystery box and speed rounds separated the field somewhat. An honourable mention goes to Isabella Newman for an outstanding performance. At this stage, we have to give a special mention to Nathan Johnson for making the judges choke on their drinks with the remark: “Well, you have to go into this kimono open, don’t you?” upon choosing to use the tomato ketchup found lurking in his mystery box. Once the score sheets were tallied, there was a standout winner. James Fowler turned in one of the most confident and compsed performances we have seen for quite some time, and all three of his drinks were excellent. James find himself in the World Class UK final for the second year running. The judges all agreed that Isabella Newman deserved an honorable mention for her performance too. 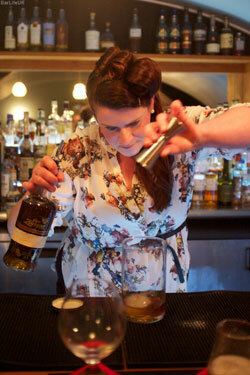 She confirmed what we have suspected for a while – Bath will be our next cocktail safari destination. Stir down, serve in pre-chilled glass. Garnish – Jamon Serrano slices and burned clementine wedges, drizzled with clementine-infused arbequina oil.